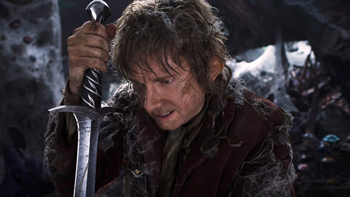 PETA reportedly plans to stage protests at the New Zealand, US and UK premieres of The Hobbit: An Unexpected Journey. Animal wranglers involved in the making of the upcoming Hobbit trilogy claim that the production has caused up to 27 avoidable animal deaths. According to the wranglers, the animals died because the farm they were kept on when they weren't working was filled with bluffs, sinkholes and other "death traps." The wranglers claim they repeatedly raised concerns about the farm, which housed some 150 animals during the production, with their superiors, but that no changes were made. Wrangler, Johnny Smythe, claims he was fired after arguing with his boss about the treatment of the animals. The American Humane Association confirms that no animals were harmed during the actual filming, but admits that it only monitors film sets, not the facilities where animals are housed and trained. The association did investigate the farm at the production company's request and recommended a number of changes, including upgraded fences and farm housing. Matt Dravitzki, a spokesperson for director, Peter Jackson, confirmed that numerous horses, goats, chickens and one sheep died at the farm, and that at least two of the deaths were "avoidable." He also claimed that some of the 27 deaths were down to natural causes and that the company spent hundreds of thousands of dollars upgrading the housing and stable facilities in early 2011. Dravitzki added that the company no longer leases the farm and none of its animals have been left on the property. He also pointed out that Peter Jackson had adopted three of the pigs used in the filming. Everyone's favorite terrorist-funding, animal rights organization, PETA, has caught wind of the controversy, and reportedly intends to stage protests at the New Zealand, US and UK premieres of the film.